The products and information you need to block sand your project like a pro are all here! Everything you need to know about block sanding straight and contour surfaces like a pro with Kevin Tetz. KEVIN'S KORNER: Create laser-straight body panels. Kevin uses Eastwood Guide Coat, Evolution HVLP gun and Contour Body Fillers on "Project Jaded." What grit sand paper should you use? What is the benefit to wet sanding? What are the advantages or disadvantagres to using a DA Sander? (Q) What grit sand paper should you use? (A) This is where each primer will be slightly different. Prepping primer like our Contour Polyester Primer could go one of two ways. You could “finish” prep it in order to paint directly over it or you could treat it like body filler and simply block sand it flat and then prime over it with another material. If you’re going to be finishing it in order to paint directly over it you should use a combination of block sanding and DA sanding. You can rough out your work with 80, move to 180, 220, and then finish blocking with 320 grit. To get rid of those straight scratches you should DA sand with 400 grit. You could add another finer grit like 600 but in my experience 400 has proven itself to be fine enough to paint over with most materials. You should never wet sand polyester primer; it will absorb the moisture and could potentially cause issues down the road if it doesn’t completely evaporate before painting. If you want to prep polyester primer in order to prime over it with another material, start block sanding with 80 to break it open and roughly knock the panel down flat and then do the majority of your blocking with 180 grit and finish with either 180 or 220 grit on a DA sander. This will give you the flat surface you need and avoid the extra work and time spent finishing with the finer grits. 2k Urethane Primer would be the next step from here. (Q) What are the advantages or disadvantages to using a DA Sander? 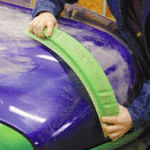 (Q) What is the benefit to wet sanding? Do I need to use a sanding block? Why should I use Contour Polyester Primer Surfacer?